List is a component that allows you to create a scrolling list of text items. You can configure the list for single or multiple selection. The List can generate item event. To receive the event, the application must implement the ItemListener and register the listener. creates a new scrolling list with the number of visible rows. creates a new scrolling list with the number of visible rows and selection mode. adds text item to the end of the list. adds text item to the list at the specified position. delects the text item at the specified index. gets text item at the specified index. get the number of text items in the list. gets all text items in the list. gets the selected text item. get all selected text items. determines whether or not the text item at the specified index is selected. removes all text items of the list. 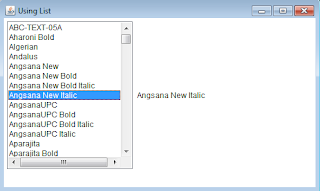 select the text item at the specified index. sets selection mode of the list to false or true. If false, only a single text item can be selected. In the example program below, we construct a List component to display 15 rows of items with single item selection. If the number of items added to the List beyond this rows limit, the scroll bars are automatically attached to the list for you. 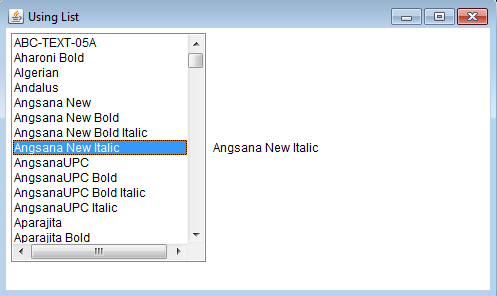 The getAllFonts method of the GraphicsEnvironment class is used to retrieve all font objects from the system. All font objects are added to the List component by using its add method.